Tom and Rich Bardon walked around what was once their home away from home, trying to make sense of how unfamiliar it now felt. The two Chicago Cubs diehards had been coming to this same place every spring for over 15 years and yet, they now felt as if they were strangers in a foreign land. Hohokam Stadium is now the spring training home of the Oakland A’s after serving as host to Cubs spring trainings every year since it was completed in 1997. The A’s signed a 20-year contract in 2013 to play their spring training games at Hohokam beginning this year. The Cubs moved a few miles west to their newly built spring training facility, Sloan Park, which opened in 2014. The open house on Saturday was the first chance for fans to get a look at the Hohokam makeover. What first struck fans when they walked into the park was the colors. Gone are all traces of the famous blue and red that ordained Hohokam for so many years. Instead, yellow and green line the exterior of the stadium, with a huge “A” standing out atop the roof. Inside, pictures of Reggie Jackson and Jose Canseco have replaced those of Ernie Banks and Mark Grace. New paint covers the interior concourse, outfield walls, and almost all of the fans who turned out were clad in A’s colors. Those changes include a 56-by-29 foot high-definition video scoreboard, new shaded party decks that replaced bleachers in left and right field, wider seats down the foul lines and renovations to the clubhouse and weight room. According to the city of Mesa, the total cost to upgrade the stadium and the adjacent Fitch Park training fields was $26.9 million, although the city’s contribution was capped at $17.5 million. The remaining $9.4 million was put up by the A’s. The park clearly has a different feel with the new branding and amenities, but it still looks similar enough to the old Hohokam to make a return trip bittersweet for Cubs fans. Both old and new fans are looking forward to the new era at Hohokam and have circled one date in particular on the calendar. 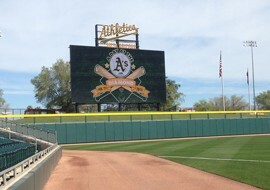 The 56-by-29-foot scoreboard is the centerpiece of the Hohokam Stadium renovation.